Today in Newtown, CT, twenty children and six adults were killed at the Sandy Hook Elementary School. Such a horrific tragedy leaves us wanting to do something to ease the pain of those affected. We invite you to leave a message here for the families of the victims and for the survivors at the school. Condolences will be gathered here for a time, then printed and bound and sent to the school. 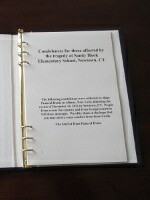 PLEASE NOTE: We gathered messages through January, then print them, bound them, and sent them to Newtown. It is our hope that the messages we sent from all those who participated will bring some comfort to those who are grieving. Please know our thoughts and prayers are with you as you try to make sense of this unspeakable horror. You have our support and love! I am in tears as I send my heart felt condolence to “all” Mom’s,Dad’s,Aunt’s,Uncles, everyone of Newton. I am a Mom also and though my son is grown I fell sorrow for your losses. May God send his angels to surround and hold you in this sorrow. This breaks the hearts of our country and our religions. Note: sorry for the bad English. I don’t even know any of the 26 people that died, but I still cried when I heard. I bet the kids were bright and I know in.my heart they did not deserve to die. I’m sorry. They were probably the best kids anyone could have. So sad and so, so sorry. My families thoughts and prayer are certainly with the families of the victims and the entire community. I was very close to the Columbine incident and can most certainly feel the pain all are experiencing. God bless you all. Nothing anyone says will make this any better for the families, friends, and community effected by today’s events. It’s times like these where people have to wonder; is there a god? And if there is, what type of god would let something like this happen? For those of you who struggle with this idea, myself included, I ask you to have faith. I ask you to believe that these children, these teachers, have been taken from this world polluted by violence to eternal peace and happiness. I, like many others, am a stranger to the victims of this absolute hate. That being said, it doesn’t matter because these adults and children have impacted people across America. You will never be forgotten..you are gone too soon. To the community of Newtown, my sincerest sympathies are with you. May God help you find the strength to go on; we love you. Dear families ,friends and neighbors of the tragic events December 14, 2012 in Newtown,Connecticut. Please know I understand your pain and loss. I offered my prayers all day and will for the future for your murdered loved ones and for you their survivors. Please find a support group like Families of Murdered Victims.it can be helpful to speak with others like ourselves. I too am a parent of a murdered victim ! I am so sorry for the deaths today and I grieve with all of you. God bless the children, their teachers and the families left behind. Please know that we are praying for the families of the victims and for the victims of the violence at Sandy Hook! We pray that you will find the support and love you need to go on. Our thoughts and prayers are with you. Love, the Hans family. Being a mother of 2 boys, I can’t image your pain. Please know that my family is praying for all of you. I’m so sorry you have to go through this. God will be your strength and keep your eyes on him for help through this difficult time. We will continue to pray for all of you! My God get you through this! It’s my strongest wish that in the coming hours, days, weeks, that you will, in private moments of darkness, of quiet, find that place in your heart where you smile with profound fondness for those simple moments and memories. And in the silence of those moments, find peace. Our hearts and thoughts and prayers go out to those at Sandy Hook! My deepest sympathy and condolences to all involved in this horrible senseless tragedy. My heart is with all the beautiful angels and their families. Sending my thoughts and prayers to all involved. I pray for God to comfort you and give you strength during this very difficult time. Please except this cyber hug and know your not alone. May God hold all your loved ones dear in Heaven!!! Much love coming from Bend, Oregon!!!! God Bless!!!! My heart feels like it is breaking into a million pieces. Although not a parent myself this tragic and unbelievable loss has brought me to my knees. Please know that I share your grief – as do so many others. May God comfort you and give you strength. Our thoughts and prayers are with you as are the thoughts and prayers of a nation and the world. You are in our hearts and prayers. The whole nation mourns with you. If there’s ANYTHING you need, please let us know. For the moment I suppose prayers are what’s most needed. I leave my email enochmoskowitz@gmail.com if you need to just need support in any manner. I am so sorry, does not even reflect the feelings I have towards your loss. My heart is broken and I mourn with you. May G-d Bless you and I know the Lord is crying with you. My wife and I, our heart goes out to each and every one of you in this town who share the closeness of a loving community, but especially to each and every parent who has lost a child and to all friends of these parents and to each and every loved one and friend of the adult women who gave their lives in order to try to protect the children they taught. May the Lord of Abraham, Issac and Jacob, Sarah, Rebecca, Leah and Rachel, grant you peace as time goes by. May Jeshua(Jesus) help to heal your hearts. I am 11 years old and I want to address the feeling that my heart is broken for all the brothers and sisters who have lost a brother or sister in this evil act of violence. I am so sad for you and your loss, the loss of your wonderful Prinicpal, and the loss of all the teachers who tried to sheid the children who were lost. My heart grieves with you all, families, friends, sisters, brothers who are left “without”. I know the Lord will hold your hand, comfort your hearts, heal your wounds in time. I can see that your town is so close and loving…..so hold each others hands, hug each other more, take a dinner to a family, offer your ears to listen to those who have lost someone and suffered this hanious crime. G-d is there with you, let him comfort you. My mom taught me that a Lady named Kubler Ross, says grief takes steps, be patient with yourself while you go thru the grief. Don’t let hatred get stuck in your life, I know it is part of grief my mom says, but let the Love that you share in your town eventually be the biggest part that helps you heal. Look around at your loving town, lean, talk , cry, talk about your hate and see someone professional or rabbi, priest, clergy if yu need help. I am so sad for all of you, my heart breaks for yu, but there is a G-d in Heaven who will hold your hand in this terrible event and help you. This message of love comes from Idaho. May the Lord Jeshua, bless you all and give you strength through your terrible, terrible. Loss. May he grant you peace. My heart is broken, and my heart goes straight to you. You are in my heart, in my thoughts, and in my prayers. As a parent, I can’t imagine the grief that surrounds your loss, but please know that the prayers of our nation are being sent up on your behalf. May God give you strength in the days ahead. With love from Bowling Green, Ky.
As a parent myself, I’ve sat in front of the TV for hours watching and waiting, and crying my eyes out for you parents. Both those who were reunited with their kids, and those that weren’t are in my prayers. All I know to say is this to those parents who lost their child, don’t try to be strong throughout this ordeal. Go ahead and be weak, let your friends and others there to help be the strong ones for awhile. Once again, I’m so very sorry for your losses and may God send an angel to all of you. As a mother of five girls, and a Kindergarten teacher too, my heart is broken on so many levels. My eyes well up with tears at the very mention of this terrible tragedy. I know that God is with all of your sweet children, (no matter how young or old they were) in Heaven and their first Christmas there will be magical! Hold their memories close to your hearts and never let those fade. Know that we are all keeping you, your children, and your families in our thoughts and daily prayers. May your tears water gardens of sweet memories. We are so sorry for your incredible losses. Our thoughts and prayers are with all of those that are grieving the loss of a loved one. Each peice of news I (Valerie) read or see on tv about this event brings me to tears! I can not imagine the pain you guys are going through! I know you do not know us and we live so far away, but if there is ever anything you need please feel free to ask. Pleast let God and friends confort you during this difficult time! Wherever you are, God is…and my heart is with you all. Love and healing is what I send at this moment of challenge and loss. Peace to those who haved moved on and peace to those still here. My heart goes out to you at this hard time. You are in my thoughts and prayers. I want to send you a link of many who are “Sending Their Love to You” and keeping you close in thoughts. I have done my very best to keep the events of Friday from really impacting my boys, but my oldest found out… so we were talking about it and he was very quiet then he says ” I feel really sad cause they were little like my brothers … What would I do with out them, and some brothers and sisters are with out their sibling… just sad Momma, we should send all the families a card. Just because they are very sad doesn’t mean they shouldn’t have a Christmas.” Sometimes that boy is wiser and older than his 8 years..It brings a smile to my heart and a tear to my eye… This is the closest thing I could find to send that card. I am saving the site so my son can see that his love and concern for the families and friends of all the lost, made it to them. Prayers and hope from our family to all those in Newtown…the Sandy Hook Community. Love is with you. As the mom of two my heart is broken. I pray that God will give you the strength and peace to get through the coming days, weeks and months. May the precious memories of your loved ones be a comfort to you. You are in my thoughts and prayers and I am crying with and for you. The whole nation mourns. I would like to leave my sincerest condolences for the families and people who were affected by this terrible life changing moment of untimely death. My thoughts and prayers are with all of you. I want you to know that I did not know any of the victims, however, I grieve with you, as does my whole family. My family and I will forever remember those of you that are dealing with this sad event. Every morning I say a prayer, and every night I continue with a prayer for all of you. I know that all of the victims are being cared for by our heavenly Father and that they are all looking down at us. My family sends love and prayers to all of you. Our hearts are so heavy for each of you and the many families-parents, siblings, grandparents and so on– affected by this horrific tragedy. Tears well up in my eyes each time I think of it. I lost a sister at age 7 and a nephew at 3 and I can promise you that your children will never be forgotten and that sweet memories will sustain you until you meet them again in Heaven. I know I cannot even begin to imagine the pain you feel as parents. I just wish I could help in some physical way but I am praying for you all. With love to you from Seabrook, Texas. My love and compassion to all the victims, families, and school community. As a teacher, my heart is broken and my prayers are with you constantly. North Carolina weeps with you. Our family wants the families that lost loved ones to know that each of you are in our hearts, thoughts, and prayers! There are millions of us praying that God comforts and heals all of you. We are with you and praying for you with all we’ve got! God will see you through! They are all safe now and in God’s care, I’m sure that God has grand plans for each of those that are with him! We are so very sorry for your loss! send our deepest sympathy to the families, children and Staff of Sandy Hook. Our hearts are broken and saddened. Our prayer are with each mother and father. If there is anything that our Day Care can do, please don’t hesitate to contact us. Director of th center!!! My heartfelt condolences to the families affected by this unspeakable tragedy. May you find comfort in all of the love, support and prayers being sent your way. Please know that you do not have to shoulder your grief alone. Our hearts are heavy and our prayers are with you. I want all of you to know that I am thinking of you as you are going through the worst thing imaginable. As a mother of two 6 years olds, my heart is aching for all of you. I am sending you thoughts and prayers and I only wish that each day is easier. God Bless you all and know that the Klugman family an hour away in NY is here for you! May the Lord bless you and keep you. The Lord make His face shine upon you, and be gracious to you; the Lord lift up His countenence upon you, and give you peace. ~ You are going through the hardest and most difficult time in your life; I can only imagine how much your heart aches. In the poem “Footprints”, the man asked the Lord why at the most difficult times in life he only saw one set of footprints. The Lord answered him saying “My son, my precious child, I love you and I would never leave you. During your times of trial and suffering, when you see only one set of footprints, it was then that I carried you.” Please know that you are in my thoughts and prayers, and that as much as possible we are sharing in your sorrow and heart ache. Words are never enough for anyone who has last a child or any loved one in your life. Our God is one of love who loved us so he sent his son. He does not punish us for sins or discipline us with evil. I am sure driving God from our schools was a poor choice 50+ years ago. I pray fervently that the love around you helps to ease some of your pain. D. Gardner, Idaho Falls, Id. I can’t even imagine, my heart is breaking for all of you. I am an average ordinary 13 year old girl. When I heard what had happened in your town of Newton Connecticut my heart sank. I was stricken with grief. I asked myself over and over again how could this happen? I knew I had to do something about this but I felt powerless being just 13. The only thing I could think of to do to help was to write this letter. I thought I might explain to you how much our small town in Texas felt. Our school held a memorial service for the children and adults that were affected by what happened. My friend Charity even told me her church had a prayer group in remembrance. All the flags that I have seen are flying at half staff. Everyone in our small town is grieving. I know this letter may not be much but I just wanted to let you know how much we all cared. May loving memories comfort you in your sorrow……. My heart is breaking to million pieces….I am praying for you, may God bless you and your families, be with you and help you to get thru this horibble and difficult time in your lives. My deepest condolences, i will not forget, and continue to pray for everyone. but, if you have other children, Please don’t lose the Christmas spirit for their sake. Our sympathy, and condolences to all. And may GOD give you strength in this time of sorrow and pain.